Great French wines are found in the Basque. Most people think of Spain when they hear the word Basque. 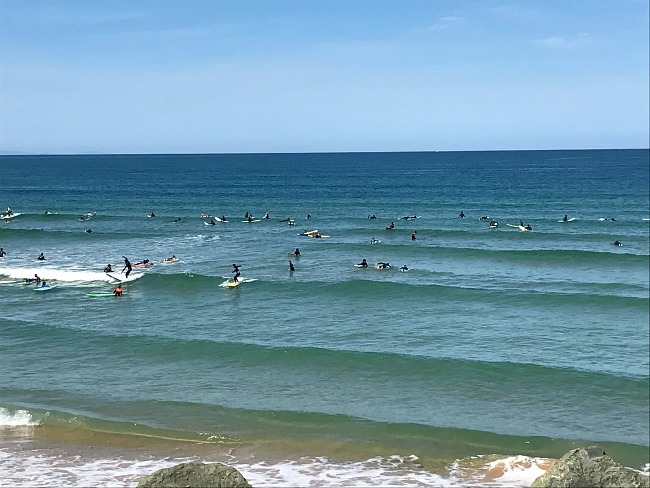 But a little known fact is 15% of the area lies within southern France, where the coastal towns of Biarritz, Bayonne, and St-Jean-de-Luz entertain sun worshipers and surfers while just inland Hendaye in the Pyrénées foothills captivates hikers. There are over 100 indigenous grape varieties in the southwest, here are just a few, maybe you’ve heard of some?!? The Pyrénées sub-region AOCs are in the bottom left corner (Iroulégy, Béarn, Juraçon, Tursan, Madrian / Pacherenc Du Pic-Bihl and Saint Mont). The La Nive river runs through Iroulégy. And the Tour de France went from Eymet to Pau July 12th! 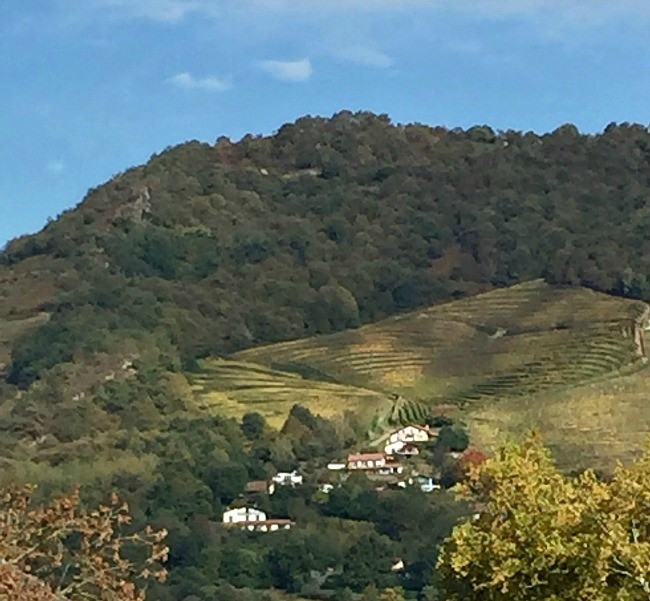 Irouléguy, pronounced “ee-rew-le-ghee”, is a small wine appellation lying within a valley just outside St-Jean-Pied-de-Port, where people start the Camino de Santiago. It’s 50k from the ocean and 8k from the Spanish border. This is part of Gascony and the Pyrénées AOC sub-region. Many vineyards are on terraced, steep slopes from 100 to 400+ meters above sea level (300 to 1,200 feet). Because Irouléguy is in a valley surrounded by mountains that shield from cooler north winds, summer and fall months are warm and dry. The microclimate has several soils types, enjoying mountain and Atlantic weather influences. This 8-hectare property, biodynamic since 2008, is run by Michel and Thérèse Riouspeyrous. It’s text book Iroulégy with a plethora of soils types, each imparting a particular character. Take Orphite, the volcanic rock with iron oxide- it brings power and structure. Grés, the metamorphic sandstone that’s principally quartz and mica imparts bright acidity and a wild thought provoking tension. Different types of limestone, common in many areas of France are found too. In Irouléguy, the limestone contains lots of clay, imparting texture, mineral notes and lively acid. In red wines, it seems to balance things out. At Maison Arretxea there is a difference tasting wine made with the same grapes but on varying soils. All whites are blends of Petit Manseng, Gros Manseng, and Courbu, thriving on the sandstone layered with limestone, clay, and various minerals. They each have a different profile. Reds and rosé are primarily Tannat, but also contain Cabernet Franc and Cabernet Sauvignon, per AOC rules. They’re aged in cement or large wooden barrels “foudres”. Arretxea produces more white than red, but the reds are worth finding. They’ve made wine almost 30 years yet we consider their style of Tannat more contemporary and rustically smooth. 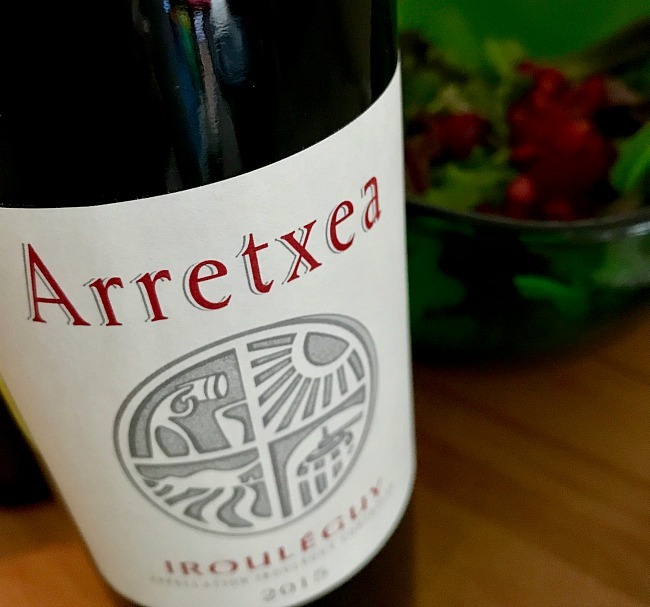 Mark and I tasted the Arretxea porfolio over a year ago. Visit notes resurfaced our delight, so much so I hunted down a bottle and reread our Irouléguy wine and hiking trip post. Back then, we researched the area however the Sommelier B&B host took us straight to Maison Arretxea (pronounced Ah-Ree-Cha). This 66% Tannat, 17% each Cabernet Franc and Cabernet Sauvignon is just 12% alcohol and not a tannic bomb as one might think. On grés soil (sandstone with minerals), it’s tamed just enough, having fresh, mineral driven brightness with rustic yet supple tannins. Aromas of wild black fruit- cherry and berry- aren’t the clean and pure kind, but remind me of picking wild berries with a bit of forest mint and field flowers. Kermit Lynch Wine Merchants imports this, and a few Arretxea white wines. (18 euros/$21). Medium acidity & body work with greens and cherries. Fabulous pairing with Beef Keftas in red onion sauce. The Domain Borda Xuria biodynamically produced white was highly recommended, a great quality-price ratio too (16 euros/$18). 60% Gros Manseng and 40% of Petit Manseng, 90% is directly pressed while 10% macerates for about 18 hours before pressing. 70% of the volume is fermented and aged in older 400 liter barrels; the remaining 30% in stainless steel vats, then blended. Total aging is 6 months. This had an intensely expressive nose of white peach, exotic fruit notes, and discrete blond raspberries. A balanced, tense yet crisp mouth feel reminded me of wet stone, citrus and dried flowers. Having a medium body with medium+ acidity, it softened elegantly, lingering on the finish and was quite nice with the mixed greens with cherries. We had it the second night with Trofie pasta, pesto and Parmesan, an exceptional pairing. I hadn’t had a wine from Irouléguy in some time and am reminded just how fabulous they are. Borda Xuria Blanc and the Arretxea Iroulégy Rouge are exceptional wines! The third Saturday of each month the #Winophiles embark on a different theme pertaining to French wine. Wine, food and travel writers and enthusiasts share their adventures and virtually meet for a tweet-up on that date. 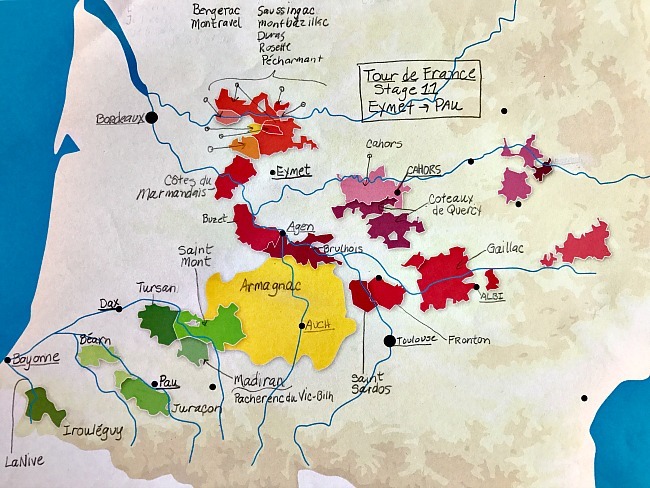 Southwest France is the July theme, hosted by Jeff Burrows of Food, Wine, Click. Our Twitter chat is July 15th – join us using the #Winophiles hashtag. Check out the #Winophiles and their Sud Ouest adventures below. Tannat in Irouléguy is different, tending to be medium bodied, lighter and fresher. The area is famous for dried Bayonne ham, sheep’s milk cheese and piment d’espelette, a spicy powder made from ground small red peppers. IGP Côtes de Gascogne, Landes, Agenais, Gers, Côtes du Lot,Thézac Perricard, La Villedieu, Coteaux de Glanes, Aveyron, Côtes du Tarn, Comté Tolosan and Ariège. The famous brandy Armagnac lies is the same area as the IGP Côtes de Gascogne! Those wines sound like incredible values! I’m not familiar with Irouléguy, and I am moving it much farther up on the list of wines I need to try next. There are some great values, and other spectacular wines costing a bit more but well worth it. The Tannat blends from Irouléguy are definitely worth seeking out, as with the white wines. I’m less familiar with the wines of the Basque country than I am those from the region a little further east but your post has me intrigued to seek them out. I think in Canada I might have a hard time but I’ll take advantage of being in France this summer to take a look! 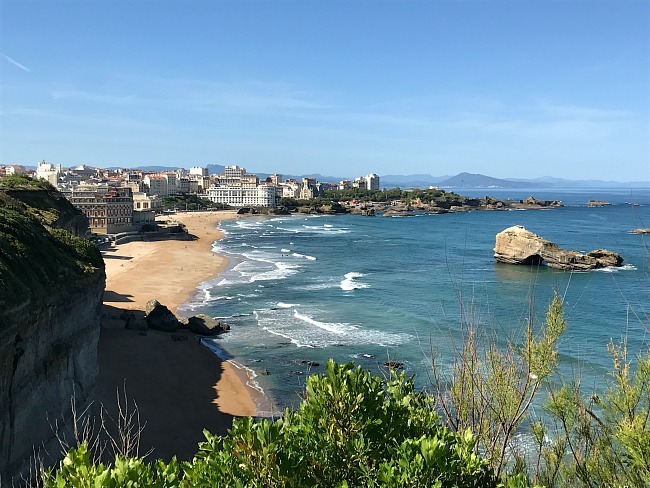 The Basque country is so very pretty too – so many reasons to visit! This is, of course, the first time I have heard of irouleguy. Thanks for such an informative post and the beautiful description of the area that makes me yearn to visit. I hope you do get to visit Wendy, thanks for stopping by! Thanks for the introduction to Irouléguy Lynn. Of course I wasn’t familiar with it. It seems most the Southwest regions are answers to Trivia questions;-) But as I read through the post, it’s becoming more and more obviously there are some very good and perhaps great wine to be found here that offer good value. And that’s right up my ally! After reading your post I tried to find some, but was unsuccessful…a shame! I was unfamiliar with this region–thanks for sharing! Now I really want to go hiking here too, as well as try the wines of course. Yes there is exciting hiking all in and around Iroulégy Nicole. Hope you get there to hike someday! These wines sound fabulous! I’m already wishing I had a glass of the white in front of me – right now! This area has an astonishing number of high-quality wines at entry-level prices; I just wish they were easier to find in the States. Thanks for giving us two more to keep in mind as we search – and for including some very delicious-looking food pairing ideas! Thanks for introducing us to Iroulégy, Lynn. We are eventually going to do a Bordeaux -> San Sebastien trip and we’ll be sure to spend some time in this area, too! Let me know when you go Jeff, happy to give you a list of wineries in Irouléguy, and also a nice one in Getaria, just outside of San Sebastien. For food, you can’t forget Arzak! This is such a beautiful part of the world and I find that the food and wine are really expressions of the people there. It is very interesting and always pulls me in! Thanks for sharing.